Users... Create interesting content to promote this Titan Media, Myspace synergy as a viable advertising platform so that once they have 52 million viewers' attention they can blast them with ads for sugar water. In another twist on digital tie-ups, MySpace has partnered with Titan, a global out-of-home advertiser focused on mass transit, to bring personal messages from MySpace users to high-visibility digital displays in public places. "Step Up to the Mic" is positioned as a joint promo campaign of the companies' media potential, highlighting their value as ad platforms. As part of the user-generated promotion, MySpace and Titan are inviting MySpace members to submit a short text message (50 characters or less) and picture online. The content will then appear on hundreds of digital screens in cities across Europe and America, including New York, Chicago, Philadelphia, Dublin, London, Liverpool, Edinburgh and Glasgow. Titan's displays are concentrated in and around the mass transit infrastructure in the U.S., U.K., Ireland and Canada, including train stations, bus stops, telephone kiosks and street banners. 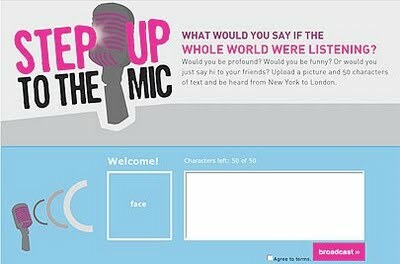 Altogether, the digital assets involved in "Step Up to the Mic" reach 52 million viewers per month, including 15 million in the U.S. Users can also upload their message and picture at the Titan Web site. At first glance, it may be surprising that MySpace, the world's largest social network, should feel the need to promote itself as an ad medium or raise consumer awareness. However, stats show the Fox-owned network has steadily lost market share to Facebook over the last few years, with the most precipitous declines coming in the last year. According to recent figures from Experian Hitwise, in September, Facebook attracted 58.6% of all social network visits in the U.S., compared to just 30.3% for MySpace -- down sharply from 66.8% in September 2008.